Welcome to another installment of LiveAnalysis! Today’s match-up will be the 11th meeting between two Spanish speakers: 21-time M1000 champ Rafael Nadal vs Juan Martín del Potro, who will be making just his second M1000 final appearance, having lost the Canada Masters final to Andy Murray back in 2009. How did both men reach this final stage? Rafael Nadal beat Tomas Berdych for the 12th straight time in the semis and brushed aside an injured Federer in the quarters. However, for my money, Nadal’s most impressive win was in the Round of 16, when he overcame a very inspired Ernests Gulbis in three tough sets. Since that match, Nadal has not lost a set. In fact, the 11-time major champion has only lost one set since the Sao Paulo semifinals. Which is frighting. Juan Martín Del Potro is probably putting together his best run at a big tournament since the 2009 World Tour Finals. He took out Andy Murray in the quarterfinals, a man he’d never beaten before on hard courts. But Del Potro did one better, ending Novak Djokovic’s 22-match winning streak in the semifinals. In both cases Del Potro came back to win the match after dropping the first set. In the Djokovic match Del Potro was even down 0-3 in the decider before mounting the last stage of his comeback. – This is one streaky head-to-head: You can see how Nadal won the first four meetings without much fuss, then Del Potro took the next three matches, only to then lose the last three encounters. Will today be the start of a new streak for Del Potro, or will it Nadal’s 4th straight win over the Argie? It’s also interesting to see that these two have never played indoors, yet they’ve played on every surface. This will be the 7th match on hard court, and Nadal and Del Potro have each won 3 times on this surface. 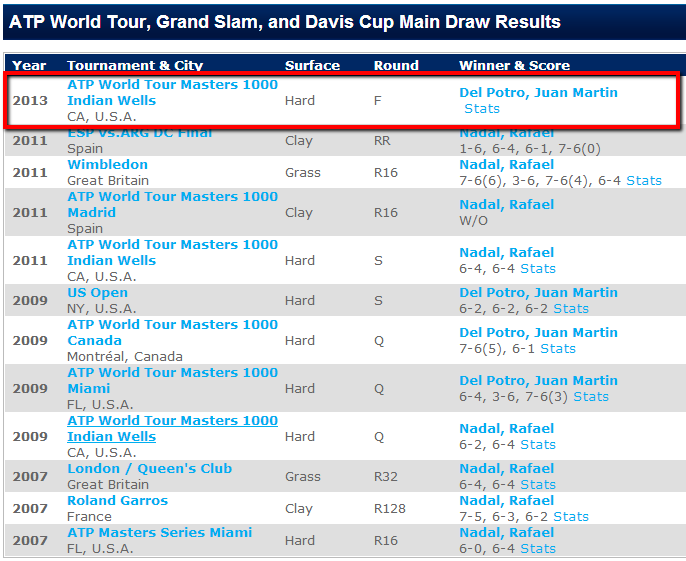 – I find it quite fascinating that out of the 10 matches, four have been at either Indian Wells or Miami. 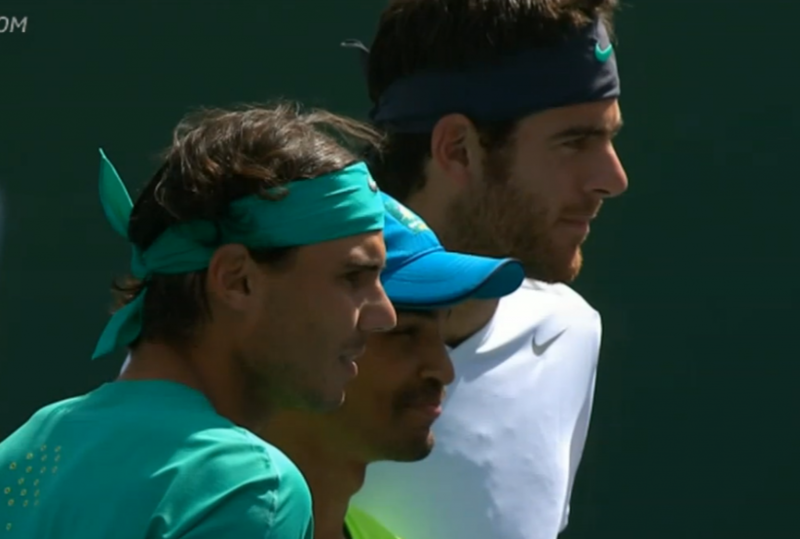 Nadal has taken 3 out of the 4, and the Spaniard was up 2 breaks of serve in the Miami match he lost to Del Po. Incidentally, that’s the only time Nadal has lost a set to Del Potro in either of these M1000 events. – It’s a little odd that the last two matches these two men have played have been best of 5 bouts. And in those two matches, they played 3 tiebreakers, all won by Nadal. Looking at their entire H2H, it seems like whoever wins the tiebreakers (if there are any), tends to win the match. – Only once in the ten matches has the winner of the first set gone on to lose the match, and that only happened in the last time they played. 1. How much gas has Del Potro have left in the tank? Overcoming Murray and Djokovic was very, very tough on him: near the end of yesterday’s match you could see the very tall Argie hunched over. It was quite an effort to get that win, and it came only 24 hours after his upset of Andy Murray. And we know that there is no such thing as a simple match against an in-form Rafael Nadal. If Del Potro dug deep to beat Djokovic, he’s going to have to dig even deeper to have a chance to take down a man that has won in the desert twice before and hasn’t lost a match in a whle. 2. How well will Del Potro be able to attack Nadal’s 2nd serve? The tall Argie put Andy Murray and Novak Djokovic under constant pressure when it came to defending their 2nd serves. Del Potro can’t let Nadal get on a groove with his serve, and he cannot let the Spaniard get away with any soft 2nd serves. 3. How aggressive will Rafael Nadal be today? As we remember, the 2-time Indian Wells champion was very reluctant to attack in the Viña del Mar final. However, Nadal was very aggressive in the Sao Paulo and Acapulco finals, and in related news, he didn’t lose a set in either match. It’s a nice situation for Nadal not having to deal with a very different gameplan than the one he used against Berdych: return well, and keep the big guy on the move by hitting to the open space as much as possible. It’ll be key today for Nadal to hit his FH DTL if Del Potro tries to engage in AD court rallies. Nadal will have to find ways to hit inside-in FHs or BHs DTL from the Deuce court, since Del Po will look to establish FH to BH rallies on that diagonal. First Set – Rafael Nadal will serve first. 0-0: Del Po starts with a BH DTL UFE. He then brings Nadal to net with a short slice, but misses the pass. Nadal follows with an I-I FH into the net. Nadal then bosses around Del Po from side to side, but lets Del Potro gets a look at a running FH pass, which Nadal can’t handle. 30-all. A tame BH UFE from Del Po gives Nadal a GP. We’re at Deuce, since Nadal sent a FH from the middle of the court into the net. The men play a very, very long rally that takes them both from one end of the other of the court, and it’s Del Po who once again sends a BH DTL just wide. GP for Nadal again. The Spaniard holds, after Del Potro sends a FH long. A challenge is coming…and Del Po is wrong. That was unnecessary. It’s pretty clear what each man wants judging from that one game: Nadal wants to engage in AD court rallies (where his lefty FH goes into Del Po’s BH), while Del Po wants mostly Deuce court rallies (where his CC FH goes into Nadal’s BH). The wrinkles are all about making the rallies end up in these situations. 1-0, Nadal: An error-laden game from both men finds us at 30-all. The only highlight has been a great Nadal FH DTL pass early on. Nadal then does something really smart: he runs around his BH, and belts a brutal inside-out FH, forcing Del Po’s error. First BP of the match, which is saved by a nice CC BH by Del Po which was followed by a good BH DTL approach that Nadal couldn’t handle. Deuce #1. Nadal again with the tactical smarts: he uses his CC BH to carve up space for his DTL FH. Executes perfectly, BP #2. But the BP goes begging on a FH UFE from the middle of the court. A rather cheap error. Deuce #2. It’ll be BP #3 for Nadal, since Del Po engaged in an ill-advised AD court rally that ended with an UFE from his part. However, Nadal gifts another BP, as he sends a FH return well, well long. Deuce #3. A new wrinkle from Nadal: he hits very aggressive CC BHs, carving up space for a simple CC FH winner. BP #4. And it will be on a 2nd serve. Another AD court rally, and this time Nadal doesn’t make a mistake: he yanks Del Potro wide, and then puts away a beautiful FH DTL winner. Nadal with the early break! That was a very problematic game for Del Po, who will find it very difficult to engage in any AD court rallies today, unless he can run around his FH and belt very aggressive I-O FHs. If he’s just hitting regular CC BHs to Nadal’s FH…he’s toast. 2-0, Nadal: Nadal starts with a DF, but then hits very good FHs (a bad patttern for Del Po) and he’s up 30-15. After a Del Po FH UFE, it’s 40-15. The tall Argie gets a nice I-O FH that allows him to come forward, and it’s 40-30. But after another AD court rally, Del Po nets a BH, and Nadal consolidates the break. 3-0, Nadal: At 0-30, we get this stat: Del Po has 0 winners and 7 UFEs. That’s…really not good. Nadal was in control of the next point, but sends a regulation CC FH into the net. A miss that could be significant…but really isn’t, since Del Po DFs to give Nadal two more BPs. 15-40. One is saved with an Ace up the T, which doubles as Del Po’s first winner of the match. Nadal once again lets Del Po off the hook with another regulation CC FH that ends up in the net. Nadal is 1 for 6 on BPs. Del Po gets a blistering CC FH in (one of his classic Del Po missiles), and has a GP. After three huge FHs, Del Potro holds. That game could be very, very significant. 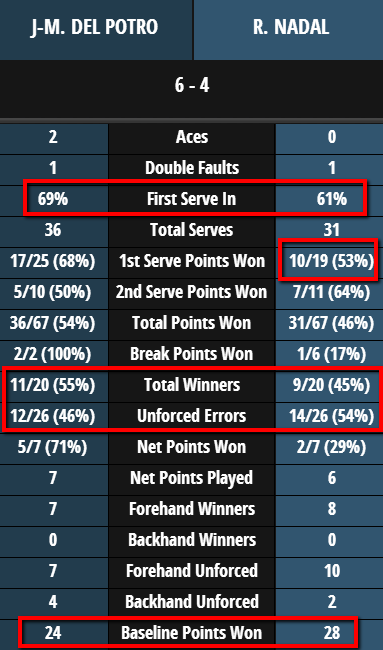 Nadal was very sloppy with those two CC FHs that he netted under very little pressure. One thing about Nadal: he’s hitting his BH so, so well. The Spaniard is using the BH DTL to start AD court rallies, and he’s also getting some nice angles and pace on CC BHs. 3-1, Nadal: Del Po is down to 1 challenge after a CC FH miss. 40-30. However, we’ll be on our first Deuce, because Nadal badly netted a baseline smash. Odd – Nadal is the king of overheads. Then….we get a very, very bad miss from Nadal, on a shot he tried to hit as FH, but should’ve probably been a baseline overhead. BP for Del Potro. And amazingly enough, Del Potro runs around a BH return, and blasts an inside-out FH return winner past Nadal. Del Potro breaks back! That was a very, very poor game from Nadal. Those last two misses had to hurt the psyche, along with the fact that he’s had numerous chances to go up 2 breaks, and instead, he’s back on serve. However, Nadal has dealt with these sort of situations before – it’ll be interesting to see if he finds a way to regain his composure after that horror of a service game. 3-2, Nadal: Del Potro comes up with an easy hold to 15. Nadal wasted a challenge in the process. You can talk about all the tactical stuff you want, but this match is now a mental challenge for Nadal – a test to see how he overcomes the disappointment of missing all those chances to be up a double break. 3-3: Nadal clinches a very easy hold that was much, much needed. Del Potro was a little too loose in that one – it was a chance to pounce and take advantage of his momentum. 4-3, Nadal: Del Potro raced to a 30-0 lead, but then sent his 2nd ball FH into the net. 30-15. After a short reply by Nadal, Del Po moves in after a powerful inside-out FH, and puts away a smash. An ace later, and he’s held easily. 4-4: Nadal engages in an ill-advised Deuce court rally, and Del Potro’s FH makes him pay. 0-30. However, Nadal returns to the pattern that favors him, drills a couple of CC FHs, and ends with an easy smash. 15-30. Del Po then comes with a blistering I-I FH, coupled with a fantastic DTL FH, and he has a BP. Huge hitting from Del Potro. Nadal sends a FH well long in a neutral rally, and Del Potro has the break – he’ll serve for the set! Amazing turn of events on Stadium 1. Nadal was in complete control of the match, and had chances to establish a tough 2 break lead. Del Potro has hung tough, and hasn’t wasted either of his two BPs. Nadal has wasted 5 of the 6 he’s created. Like in the Djokovic match, Del Potro is finding ways to win this match with his FH. He’s hitting beautiful I-I FHs that set up middle-of-the court I-O FHs, and he’s not missing many CC. Also, he’s serving way better than at the beginning of the match, and Nadal is leaving more and more returns short. 5-4, Del Potro: Nadal takes control of a point with his FH, but makes a mistake with an approach, and later sends a FH into the net from well inside the baseline. 30-0. Del Potro then blasts a FH DTL for a 40-0 lead. Nadal then properly executes his AD court strategy, and blasts his own FH DTL winner. 40-15. Then…the point of the match. They both defend, and they both come up with huge shots. Nadal’s defense was crazy. Del Potro was forced into an error by a fantastic CC BH by Nadal. 40-30. And then another incredible point that ends with a cat-and-mouse exchange at net after Del Potro comes to net and hits a drop volley off a Nadal BH pass. Nadal gets to the volley, but an out-stretched Del Potro finds a way to get a racquet on the ball, and takes the set. First Set to Juan Martín del Potro, 6-4. STATS UPDATE: At 3-0, Del Potro had 0 winners and 7 UFEs. He finishes the set with only 5 more UFEs, but 10 more winners. The giant woke up. 0-0: Two errors find Nadal down 0-30 to start the set. But he then sends a gorgeous FH DTL that barely clips the line. 15-30. However, Nadal once again approaches the net to Del Potro’s FH…and gets passed by an insane shot. Nadal gets a 1st serve in, but he sends the 2nd ball FH into the net. A very, very bad miss. Del Potro with an early break! Nadal couldn’t have started that set in a worse possible way – 3 errors, and suddenly the man who’s won 21 M1000s is down a set and a break to the Argie who’s yet to win a single one. 1-0, Del Potro: Del Po mishandles a Nadal pass, and it’s 30-all. Half a chance for Nadal to get back into the match. The men engage in a tentative rally, and it’s Del Potro who sends a CC BH long. A break point for Nadal, who hasn’t had one since he lost all those chances to go up a double break in the 1st set. AD Court rally ensues, but Del Potro runs around his BH and blasts an angled I-O FH winner. No depth from Nadal there. Nadal then misses a BH under relatively little pressure, and then makes matters worse by sending a short FH well wide when he had out-maneuvered Del Potro completely. Juan Martín Del Potro consolidates the break. Nadal is now 1 for 7 on BP conversion. And the last two errors of the last game were quite telling about what kind of psychological damage those missed opportunities are having on him. STATS UPDATE: At 2-0 in the 2nd set, Rafael Nadal has 20 UFEs…and Juan Martín Del Potro has only 14. That’s a fantastic number if you’re a fan of the Argie…and not a very good one if you’re a fan of the Spaniard. Also 14 of those 20 UFEs have come from the FH side. Another brutal stat for Nadal. 2-0, Del Potro: Nadal comes up with an easy hold, which I bet he wishes he could have done at the start of the set. 2-1, Del Potro: Del Potro starts with a bad miss, but then reels off 4 straight points, culminating with an Ace. Nadal was getting a lot of depth on his returns to start the match, but that has been slowly getting worse as the match has progressed, and as Del Potro started finding more 1st serves. And short returns simply mean more Del Potro FHs, which are hit from more comfortable positions. 3-1, Del Potro: Nadal plays probably his best game in a while, and holds to 15. There were some good FHs stuck in there. 3-2, Del Potro: Nadal is left in despair after Del Potro comes up with a ridiculous CC flick off a good Nadal volley. Everything is going the Argie’s way. However, Del Po follows that amazing point with a bad FH UFE and a DF. He added a wasted challenge, for good measure. And then, another bad FH UFE by Del Po, and Nadal once again has BPs. He’s 1 for 7 on those. Del Potro serves and volleys (!!! ), Nadal gets a good BH DTL return back, and Del Potro comes up with a beauty of a half volley. But then, Nadal gets ridiculous depth from a BH return, and forces Del Potro’s error. Nadal breaks back! Del Potro won the best points of the game….but everything else was a mess. A very, very bad and potentially dangerous game by the Argie. 3-3: Nadal consolidates rather easily, and it seems like this match has gone through another huge momentum shift. Huge – no – ENORMOUS service game coming up for Del Potro. 4-3, Nadal: A FH UFE starts the proceedings for Del Potro. Not good. He’s lost 13 of the last 16 points. The Argie then serves and volleys again… and forces a Nadal return to go wide. However, a pretty wide serve allows for a brutal I-O FH, and it’s 30-15. But then, an AD court rally ends with Nadal yanking Del Potro wider and wider, and the Spaniard puts away a simple swinging volley. And now, Del Potro makes a mistake, hitting a BH DTL right at Nadal, who moments later finds enough space for a FH DTL winner. BP for Nadal. He’s 2 of 9. Make that 2 of 10 after a very, very short return lets Del Potro put away a FH. Deuce #1. Now…a DF. Just his 2nd of the match. Worst possible time. BP #13 for Nadal. And Rafael Nadal does his thing: he survives an AD court rally in which he was dueling with Del Po’s I-O FH, and then finds an opening with a great I-I FH that allows him to put away a short FH. Nadal with the break, and he will serve for the set! 5-3, Nadal: It’s 40-0, triple SP after a Nadal Ace, a bad Del Po dropper, and a huge counterpunching Nadal FH winner. A lefty slider Ace out wide seals the set for Nadal. That’s why this guy has won 21 M1000s in his life. Even when things looked bleak, Nadal finds an opening, puts past mistakes behind him, and comes roaring back. That was so impressive. Second set to Rafael Nadal, 6-3. Third Set – Juan Martín Del Potro will serve first. 0-0: Nadal opens with a CC BH winner, and Del Po answers with a brutal FH DTL winner of his own. Nice start to the decider. A short return triggers a big FH from Del Po, and Steve Ulrich overrules it. He was correct, and Del Po loses a challenge in the process. A bad miss, nonetheless. 15-30. Then, it’s a Rafael Nadal showcase of fierce FHs. 15-40, more BPs for Nadal. A short return allows for a Del Po FH putaway that barely caught the line. 30-40. Rinse and repeat – those last two returns have been very, very short by Nadal. A short, but slightly angled return allows Del Po to put away another FH, and it’s GP for him. However, a very short return this time inspires Del Po to try a silly dropper that he misses well, well wide. As in, a foot wide. Amazing. A simple FH would’ve done the trick. Deuce #2. Nadal’s BH return goes well wide this time, and it’s GP again for Del Po. Deuce #3, after both men make a series of tactical errors that culminates in a crazy Nadal BH pass. Now another BP for Nadal, as he finds a way to resist Del Po’s missiles, turn the tables around, and finish with a dropper. Vintage Nadal there. However, just as before, Nadal sends a very, very short return back and Del Po saves another BP with a simple FH putaway. Nadal lines up a CC BH….and misses. GP again for Del Po. A short return lets Del Po get big FHs in, and he finally holds. That felt huge. You could sense that the match was in the balance right there. Nadal will feel like his returns let him down on every single BP – they were all very short. As in, a few feet short of the service line. Made life much easier for Del Potro, whose confidence can only be boosted from such a tough hold. 1-0, Del Potro: Nadal holds in less than a minute and a half. Perfect game for him, since he can pile up even more pressure on Del Potro’s service game. 1-1: Nadal botches a FH return to start, but then blasts an I-O FH winner. 15-all. Moments later, Del Po can’t handle a FH pass by Nadal, and the Spaniard has more BPs. 15-40. He’s 3 of 14 in these. Make that 4 of 15, as Nadal gets a deep return in, carves space for his DTL FH with his trusty CC FH, and finishes with a flourish. The key to all of that? The deep return. Nadal with the early break! Once again, Juan Martín Del Potro finds himself down a break in the 3rd set of a match. Yesterday Djokovic played a sloppy service game at 3-0, and that’s all Del Potro needed to come back and take the match. The question now, as it was at the beginning of the match, is how much does Del Po have left. This has been a tough, physical match, and it’s his 3rd in 3 days. STATS UPDATE Nadal has won 60 baseline points. Del Po? 44. That’s huge. 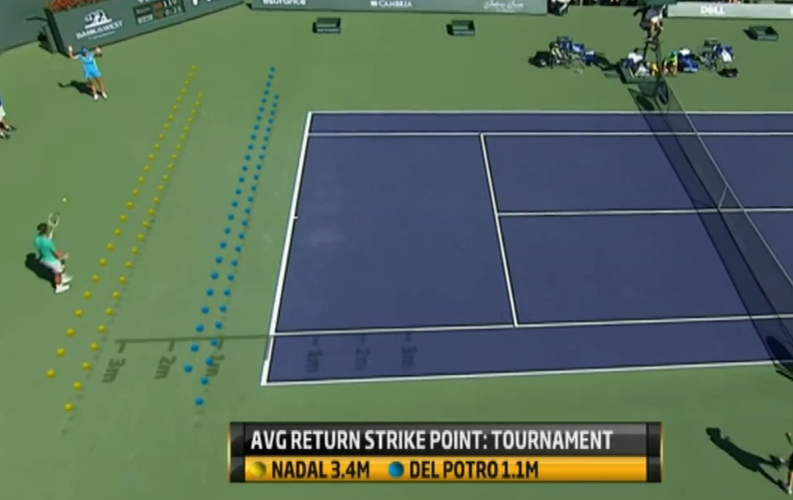 Aiding Del Po is the fact that he’s served at 72% 1st serves until this point. Which is nuts. 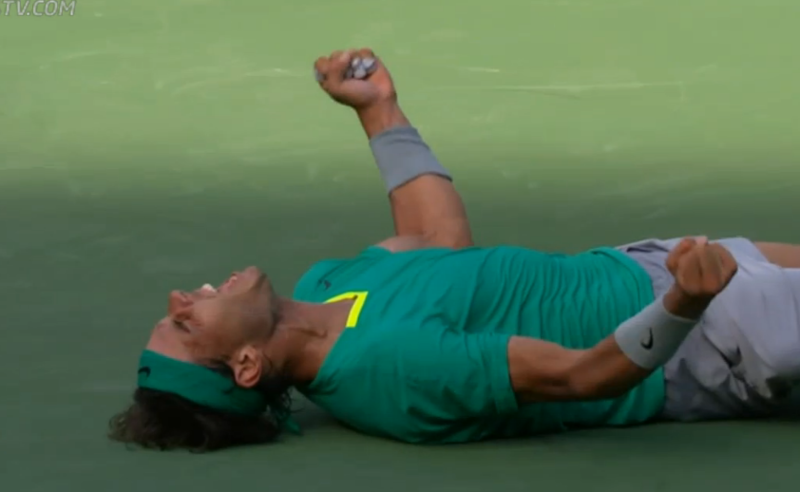 2-1, Nadal: Nadal struggles with depth, Del Potro steps in, and a blistering I-I FH winner makes it 0-15. A great start for Del Po. Nadal gets an AD court rally…and sends a FH into the net. 15-30. Del Po then out-maneuvers Nadal to the point where a desperate lob by Nadal just makes it inside the court, and Del Po sadly makes a bad FH UFE moments later. Then, a BH CC miss by Del Po, followed by a wicked lefty slider. Nadal consolidates the hold, not without some nerves. 3-1, Nadal: Del Potro bounces back quickly with a 40-0 lead. Good serves have helped. Speaking of which, an Ace seals the love hold. That was exactly what Del Potro needed after the disappointment of getting broken and then wasting that half chance in Nadal’s Subsequent service game. 3-2, Nadal: Brutal FHs abound for Nadal at the moment. He’s up 30-0. Remember that point in the 2nd set where Nadal had 14 UFEs off that wing? He’s only had 2 more since. Another brutal FH combo makes it 40-0. Del Po goes for a big 2nd serve return…but misses. An easy, impressive hold for Nadal. 4-2, Nadal: Nadal only gets one deep return so far, and Del Po has pounced on the others. 40-15. Nadal sends a return well long, and Del Potro has held to 15. The match seems to hang on the depth of returns now. Whoever can get a deep return in has a higher chance of steering a rally in his favor, and so far, Nadal has had more success in that department than Del Potro. Del Potro is still playing the right way, attacking when he can and trying to get himself out of AD court rallies. His problem is that Nadal’s FH is not leaking errors anymore. 4-3, Nadal: Nadal races to a 40-0 lead, and fires an ace to put himself only one game away from a 22nd M1000 title, which would be a new record. 5-3, Nadal: Del Po starts with a DF. Not the best way to start what could be his last game of this final. Nadal puts Del Po on the run, and Del Po nets a CC FH. 0-30. Nadal then gets an insane return in, and gets to triple Championship point with a brutal I-I FH winner. Amazing. Del Po saves a MP with a service winner. 15-40. Nadal sends a middle-of-the-court FH long. Nervy miss. 30-40. Short return, and Del Potro pounces with his FH. Deuce #1, 3 MPs saved. Another short Nadal return, and it’s GP. Clutch serving by Del Po, who looked down and dusted at 0-40. Once again, Nadal’s returning on BP have let him down. Nadal finally gets a deep return in, but it doesn’t matter – Del Po ends a tough rally with a great dropper, and Nadal will have to serve this match out. 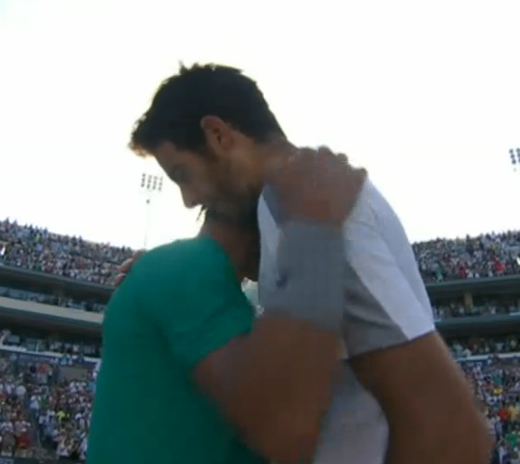 That was a very impressive stand by Del Potro. Found some great serves at the right time, and his FH did not miss. Impressive. Now, can he mount a second comeback in a row? No margin for error now. One of my favorite things about tennis happens when certain circumstances in a match lead to a juncture where forehands, backhands and patterns of play don’t matter anymore, and it’s all about how one of the players overcomes a huge psychological blow. Rafael Nadal found himself in such a situation after dropping the first set and then going down a break to start the second set. The man from Manacor had a huge mountain to climb, and the main problem was that he, Rafael Nadal, knew that he had been in firm control of the match until just moments before. At 3-0 in the first set, Nadal had 3 break points to go up a double break and effectively seize control of a set he had thoroughly dominated. 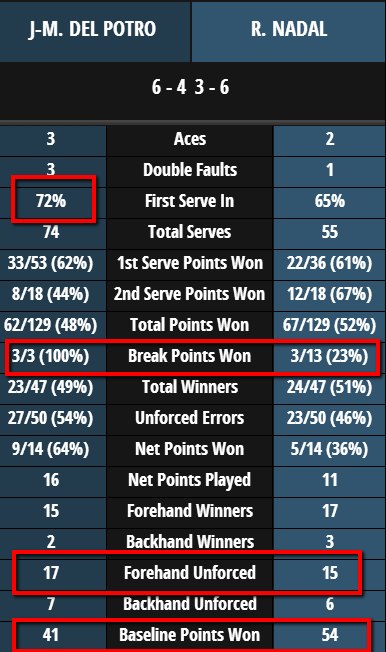 Nadal wasted all of those break points (he would end up converting just 4 out of 18 break opportunities, for a measly 22% conversion rate), making some uncharacteristic unforced errors in the process. Then, in the following game, two strange errors off of baseline overheads led to what seemed unimaginable just moments before: the set was somehow back on serve. Not only that – Del Potro seemed to come to life at that moment, and he quickly wrestled away the control of the set from a shell-shocked Nadal. As we know, Nadal then found himself down a set and a break shortly thereafter. As I noted above, Nadal had committed 20 UFE up to that point. But…do you want to hear something that’s pretty incredible? Rafael Nadal had only 7 more UFEs for the rest of the match. How does someone do that? In a match where the opposition is firing on all cylinders? After wasting so many chances and losing a set he had no business losing? This doesn’t have much to do with forehands and backhands. It’s all about the mind, and how an elite tennis player can overcome the disappointment of bad mistakes that were made, and huge chances that were left unused. More than that, it’s about how an elite athlete can overcome the terror of foreseeing a defeat caused by his own mistakes. Yes, things did not look all that great for Nadal in that second set. He wasn’t getting any more looks into Del Potro’s service games. The impressive Argie was serving with more and more confidence, and the match seemed to be slipping away. A match that Nadal had dominated for a significant stretch. What is fascinating about the 2-3 game in the second set in which Nadal broke Del Potro back was that it was the Argentine who won a most incredible first point in that game. Nadal even produced the kind of gesture that says “Damn it, everything is going his way.” The adversity seemed impossible to deal with. But Del Potro would follow up that point with several gifts that let Nadal back into the match. And that was his mistake. This is a good time to remember that Juan Martín Del Potro has not been in a big final since the WTF title match of 2009 (which he lost). All the elite players know that you can’t have such a loose service game against an all-time great in a final. You just can’t let him back in. You just can’t let them believe again. That break was all that Nadal needed, and Juan Martín del Potro would never again have a chance to break for the remainder of the match. Sure, Nadal wasted some more break points, but the damage was done. The man who now owns the record for most M1000 titles (at age 26) would go on to remind the world just what a force of nature he is, and also let all of us know what we were missing in those long seven months in which he was absent from men’s tennis. – Nadal won 20 (!!!) more baseline points than Del Potro. Twenty! Five games’ worth of points! – Nadal ended up with 5 more winners than Del Potro, including 3 more forehand winners. – Nadal finished with 11 fewer unforced errors. – Nadal won 74% of the points played on his 2nd serve. That’s enormous. – Juan Martín Del Potro served 71% 1st serves. He won 66% of those points. – Rafael Nadal created 18 chances to break serve. Eighteen! Yet he only capitalized on 4 of those occasions. Juan Martín del Potro, on the other hand, broke Nadal in every single chance he came across. That’s a 22% conversion rate going against a 100% conversion rate. In other words, even though Rafael Nadal created six times as many chances as Del Potro created all match, the Spaniard only ended up converting one more than his Argentine friend. This is why we ended up with a very close final. But what is remarkable is that we’ve seen time and time again a scenario where Player X creates endless break point chances, doesn’t convert, and lets his/her frustration invade his game, leading to a heartbreaking loss. Yet Rafael Nadal refused to follow that path. One of the aspects of this final that I’ll always remember is how it became a fantastic duel between two absolutely great forehands. Nadal’s came out on top, but it was a breathtaking battle to watch, particularly for the tactical wrinkles that each player had to sort out in order to let their forehands give them a chance at winning the match. Both Nadal and Del Potro had to find ways out of patterns of play that favored their opponent, and switch them in their favor. Nadal had to avoid Deuce court rallies, since he did not want to have to deal with Del Potro’s huge forehand with only his backhand as his ally. Similarly, Del Potro had to find ways to get out of AD court rallies where Nadal had the edge, since that vicious lefty forehand did a lot of damage by pulling Del Potro further and further away from the middle of the court, thus creating space for a Nadal forehand down the line. You can tell someone has a great forehand when they can do many, many things at a high level with it. Both Nadal and Del Potro can hit their forehands cross-court or down the line from any part of the court. They both can end points in many ways using their forehands. They both defend very well with it (Del Potro’s forehand defense was a particular revelation of the tournament). At the end of the day, both the Spaniard and the Argentine live and die by that stroke. It’s great news for men’s tennis that Juan Martín Del Potro looks to have finally regained his fearless 2009 mojo, and looks set to barge into the hollowed ground dominated by the Big 4. Naturally, Del Po needs to get his ranking up – he’s currently at #7. A big reason he’s still far away from the top four spots in the rankings is his shortcomings at the M1000s: this was only Del Po’s second final appearance, and he’s still without a M1000 title. However, this week shouldn’t be regarded as anything short of a breakthrough for the 24 year-old from Tandil. He beat Andy Murray and the World Number 1 Novak Djokovic, who was on a very long winning streak. And Del Potro showed in that final, saving all those break points and even three match points, that he’s a force to be reckoned with. Miami presents itself as a huge opportunity for him, since for once, his path to the title is somewhat “simplified,” since neither Federer or Nadal will attend the tournament. Once again, Del Potro will have to deal with Andy Murray and/or Novak Djokovic, both of whom will be licking their wounds and looking for another crack to set things right against the tall Argie. As for Rafael Nadal, he’s headed back home after a most successful comeback tour. The final balance indicates 3 titles, one of them a M1000 on hard, and a 500 on clay. Yes, he lost a clay final to a journeyman, but that was natural after being away from the sport for so long. The greatest clay court player in history will resume his activity on his favorite surface: the European red clay. And he’s riding a 14 match-winning streak. All I could think of when I wrote that last paragraph is this: good luck to everyone in the ATP who will try to beat Rafael Nadal anytime soon. Love your final thoughts. I was rooting for Delpo, but it’s so good to see Rafa back. The way he plays in adverse situations never ceases to amaze and inspire. Thanks, qtaro. I’m glad you enjoyed it! Thanks again JJ for a wonderful write up and play by play analysis…………..just wonderful and so fair to both players. As you know I am a Rafafan ALL the way (like Amy) but Delpo was such a fighter and great sport that I really admired him as a person as well as a wonderful tennis player. Rafa was, well……………Rafa and that megawatt smile throughout all the ceremonies just mirrored all the joy (and relief) of his fans!! Vamos Rafa!!! What a gift you are to tennis and all of us who love tennis (and RAFA)!! And what a wonderful gift The Changeover site is to those of us who don’t get to see all the game action live………..if at all. Thanks again! Thank you so much for all the nice words, Margie. I really appreciate it! Va mos Rafael adorable Nadou baby! Thanks for that, Aube! Miami is a wonderful opportunity for Del Potro to finally get his first M1000. At least he won’t have to beat 3 members of the Big 4 to win the title! Loved the whole piece, JJ, especially your final thoughts. You are a fantastic writer! I shouldn’t have been surprised to see how quickly Rafa went from tentative movement and shotmaking decision to full-on HC mode within the space of a month, I recall being amazed at his efforts at ’06 Wimbledon. You could see him figuring out how to play on grass with every single match – every time, he was tons better than the last match. The guy is a quick study, no? These last two matches were exactly what Rafa needed to get back into the swing, so to speak – two tough opponents, and a dogfight vs Juan DP. We all know Rafa loves to fight – it makes him happy… but also hones his tennis skills. And Del Potro? Fantastic, it’s just great to see him finally (fully) back from that long injury – I think this tourney will give him great confidence in the future. He will be a force to be reckoned with. Some of those FH’s I saw in the final? I call them ‘take your head off forehands’ – jeebus! Lethal, deadly, there is no way anybody’s going to get one of those back. What a great tourney, great result, I’m happy for both guys, especially the Rafa. Thanks so much for the analysis! Thank you very much, marron! I’m so glad you liked it. I completely agree with what you say about Nadal. He really lives for those situations where a lot of questions are asked of him, and his back is against the wall. He likes to suffer, he loves to fight through the adversity. And the way he adapted to Indian Wells and improved match after match was just remarkable. I think the 2013 Indian Wells made a strong claim to top the M1000 Power Rankings for this year. What a tournament for the men: there were 4 fantastic matches (Nadal-Gulbis, Del Po-Murray, Del Po- Djokovic, Nadal-Del Po), and it couldn’t have ended in a better way. For my money, Nadal-Gulbis is the second best match this year has seen among the men. Great analysis and summary of the match, one of the best I’ve read. Really enjoying the site and your match analyses! Love your humor and love for the sport. As a Rafa fan and having watched him play some epics and come through a lot of sticky situations in the past I was still in awe of how he was able to pull through this match. This guy is just amazing and something truly special. Speaking of the forehand to forehand battles, watching the top guys and especially the big 3 (Fed, Rafa and Novak) the more you realize the importance of the forehand and having variety on that side, and I’m wondering if even with the improvements Murray’s made to his if he can ever get it to a level where he’ll be able to dominate the way they can and if that will be important for him going forward to win more slams. Regarding the match, I was wondering why Delpo didn’t go after Rafa’s 2nd serve more the way he went after Novak’s, although many players have mentioned Rafa’s 2nd serve can be deceptively good. Thank you very much, L. You make a good point about Murray’s forehand, though I do think that shot has improved to the point where it doesn’t hurt him anymore and lets him be very competitive against the other members of the Big 4. But as you say, getting to the top is quite difficult without a big forehand. Fortunately for Del Potro, he doesn’t have to worry about that. About Nadal’s 2nd serve: it’s a tricky one to handle, because of all the spin Nadal puts on it, and the way it travels in a different trajectory than a regular 2nd serve. That makes it quite difficult to take on the rise, as Del Po was doing to Djokovic and Murray’s 2nd serves. Also, Nadal does a fantastic job of defending his 2nd serve, given his incredible ability to anticipate and defend against other player’s aggressive shots. 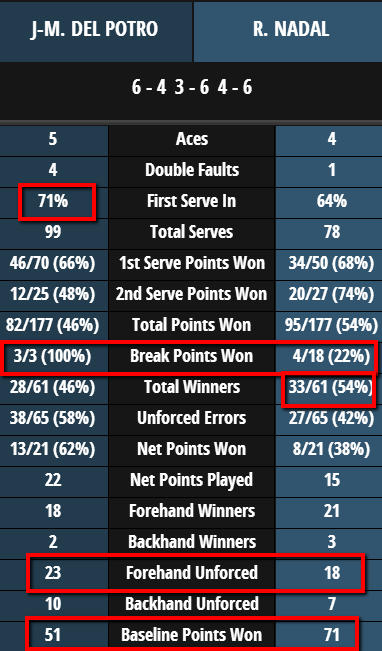 All of that (and other things, I’m sure) helped Nadal get to such a healthy percentage of 2nd serve points. So excited to see what this season brings after that totally unexpected final. Butttttt i do think things will go back to normal next week in Miami with Djokovic or Murray probably winning the title. No fed or rafa this year, Miami will be a bit empty no doubt. Agreed about Miami being a little empty, Tennisfan. It’s rather unfortunate, and I think both Federer and Nadal made the right decision to skip it. I love the Miami tournament, so I hope others step up to make it a fun event for the ATP side of things. There’s always a chance of a Janowicz’ kind of run from someone who nobody is thinking of! Shocking stat on the breakpoint conversion btw for Nadal-4/18? Great live analysis, insightful thoughts about both players, totally respectful and knowledgeable. Your site is a wonderful place to come for tennis information and analysis. Keep up the good work! Thank you very much for the kind words, SamG! I can speak for all three of us at The Changeover when I saw that we’re very happy you like our site. Thanks again! I’ve just found your website after 2-3 days enjoying, finding, reading articles about Rafa’s win at Indian wells 2013. Your analysis and everything youv’e done above (stats, thoughts etc. )are fantastic, brilliant exactly. Thank you very very much for this totally worth-reading analysis. I’ve already bookmarked your website to my Firefox so I won’t miss your next things for sure. Thank you very much for the kind words, Fairypin! I really appreciate it.